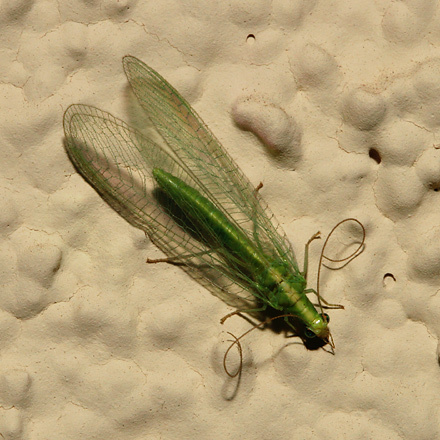 I recently spotted this tiny Green Lacewing (Family Chrysopidae) resting on a stucco wall near a light that had been left on all night. I'm not sure why its antennae were curled or even if this is normal. When photographed from another angle, the camera's flash caused the dark eyes of this Green Lacewing to glow red and painted its delicate wings with lovely pink iridescence. 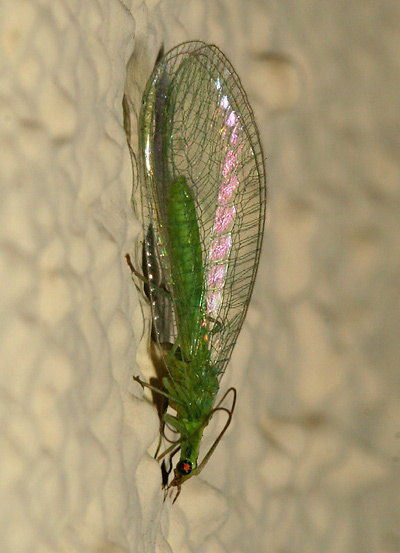 Not surprisingly, Green Lacewings are green, and their transparent wings have a lace-like pattern of veins. Green Lacewings are considered to be highly beneficial insects because their fierce larvae are voracious predators of plant pests like aphids.